London-based comic artist and author Tom Gauld is well known for his work with The New Yorker, The Believer, The New York Times and, of course, The Guardian for which he’s been regularly contributing comic strips since 2005. We featured him on our site just last year for his graphic novel Mooncop (2016) and he’s already back with another book! Like his 2013 collection You’re All Just Jealous of My Jetpack, Tom’s latest is a delightful collection of recent work. 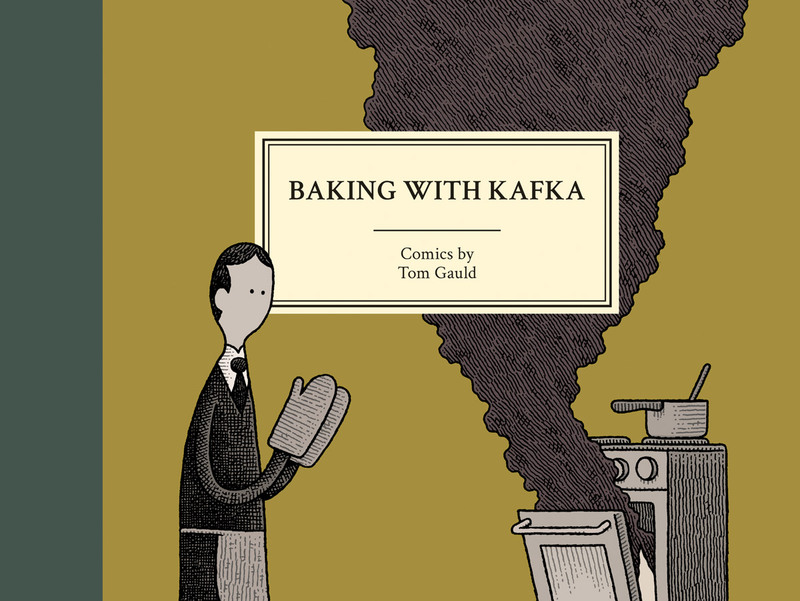 Filled with clever references and humorous observations, all told in his usual timeless style, Baking with Kafka offers something both refreshingly new and comfortingly familiar. 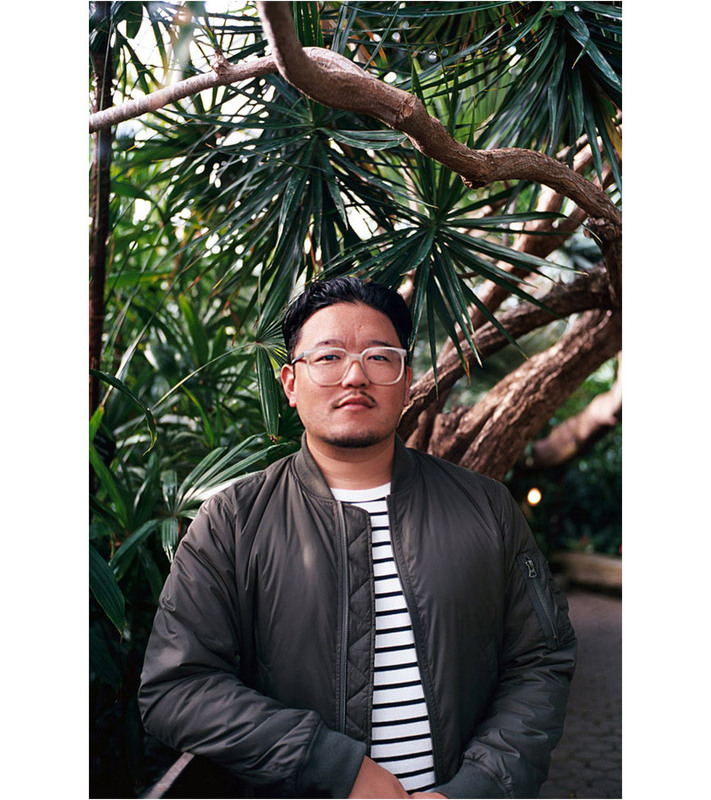 With the book’s release this week we caught up with Tom once again and got him to share some tricks of the trade as well as his personal book/indie comic recommendations. Check out our full interview and images from Baking with Kafka below! 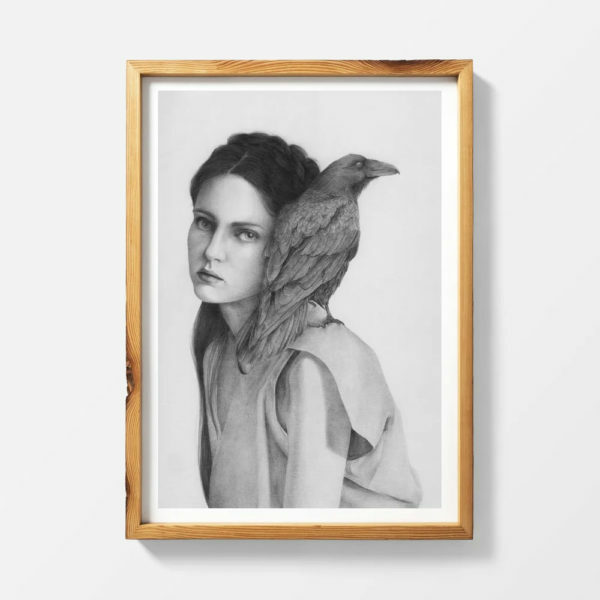 You can also enter for your chance at one of two free copies from our friends over at Drawn & Quarterly. Leave a comment below and tell us your favourite comic strip. Booooooom: You poke a lot of fun at technology and our relationship to it. How do you actually feel about its role in our lives or the kind of texting vocabulary we’ve come to adopt? Are these simply amusing behaviours or do you actually lament what we’ve become? Tom Gauld: Personally, I have mixed feelings about technology; I use the computer in all my work and the internet has given me access to lots of art I’d never have found otherwise, but I also definitely spend way too much time staring at my phone. In terms of the cartoons I find it amusing to juxtapose the “high-art” aspects of literature with videogames or smartphones, but it’s not really a value judgement, just a way of looking at things differently. I try to avoid anything which could be interpreted as “kids these days just look at screens and have no culture” which I think is nonsense. Booooooom: Where do you think you get your sense of humour from? 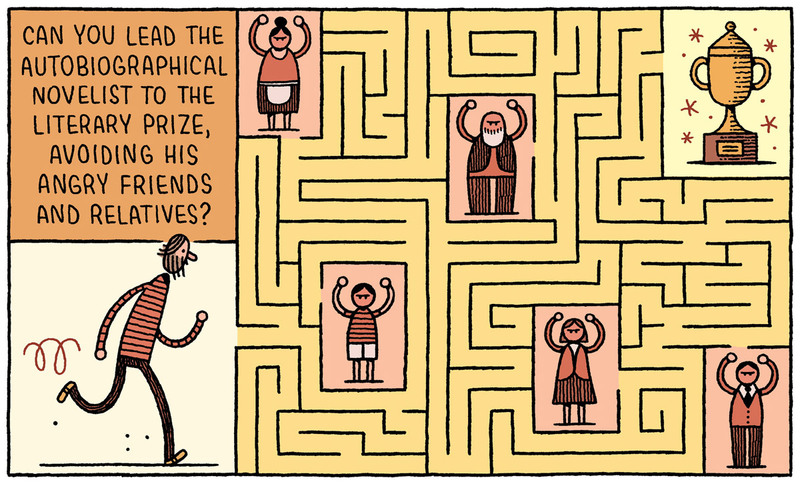 Tom Gauld: I don’t know exactly. I watched a lot of funny British television growing up, and always liked making my friends laugh. I drew silly cartoons to amuse classmates long before I drew comics ‘for real’. I’ve been making these weekly, literary cartoons for the Guardian for about twelve years and I’ve definitely learned how to be funny on the page along the way. Unfortunately the process of making funny cartoons usually involves the unfunny process of frustratingly searching for a spark of an idea, thinking hard about it and carefully reworking and honing it until it seems to work. 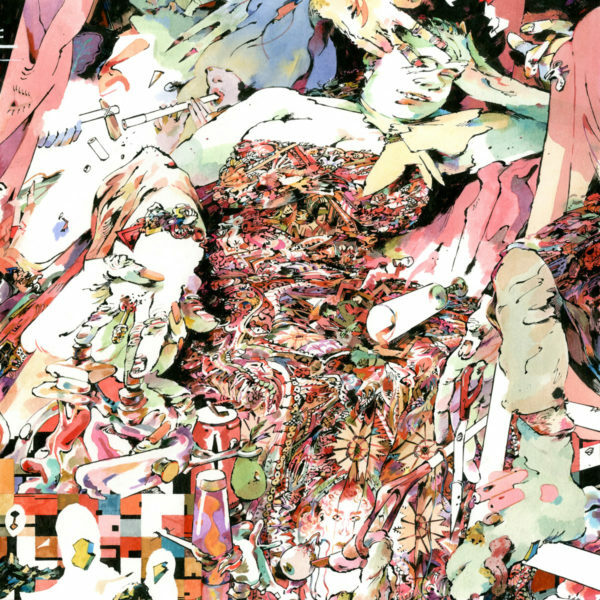 Booooooom: Your style and tone always strikes me as Classic in an almost purposeful or nostalgic way. How would you describe yourself? 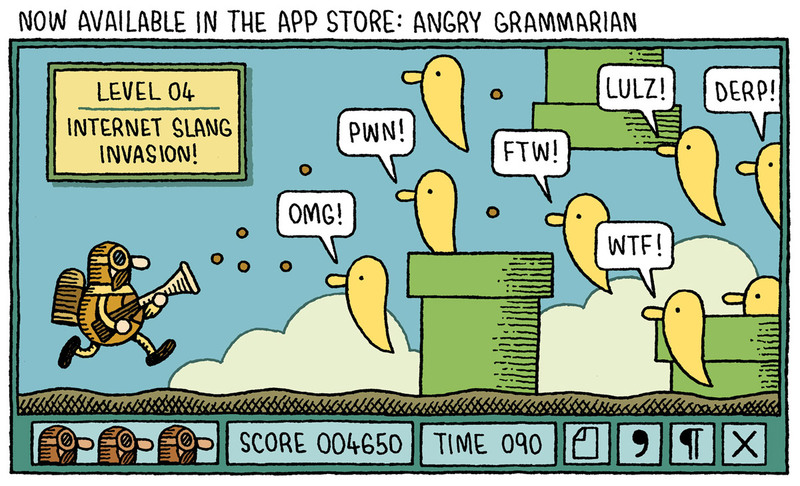 Tom Gauld: Hmm. I’m happy with classic but not sure about nostalgic. There are definitely things from the past that I love and am inspired by, but ‘nostalgia’ (for me, anyway) suggests a dissatisfaction with the present, whereas I feel we are in a real golden age for comics. Herge’s Tintin books were some of the first comics I ever saw, and I think his clear-line style is lodged in my brain as a kind of platonic ideal of cartooning. I like to be visually playful, but I’m always aiming for an underlying simplicity and readability. Booooooom: Literature, writing and publication are recurrent themes in your strips. What would you say has been your biggest literary influence? 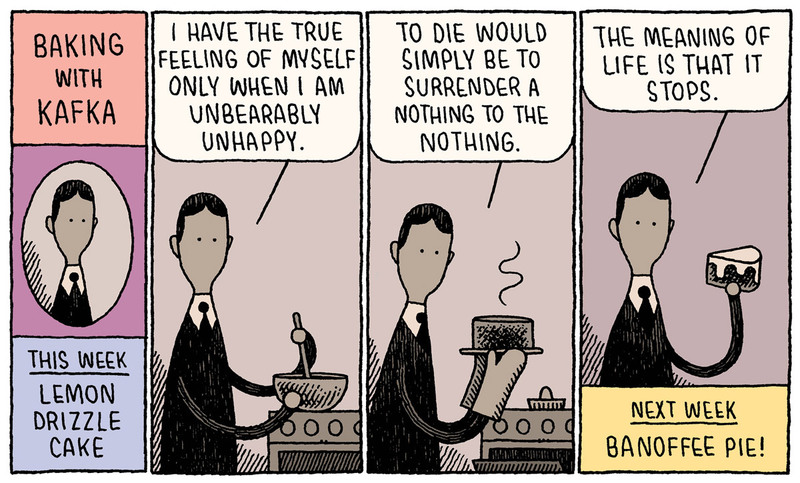 Tom Gauld: I’ve read a lot growing up but didn’t have any ambitions to be a writer. I drew all the time and thought I’d be a visual artist of some sort. It was only when I was at college that I started making up my own stories, and looking at literature for inspiration rather than just pleasure. I’ve always loved P.G. Wodehouse’s books which come across as light, charming and very funny, but only feel that way because they are so carefully, beautifully written. 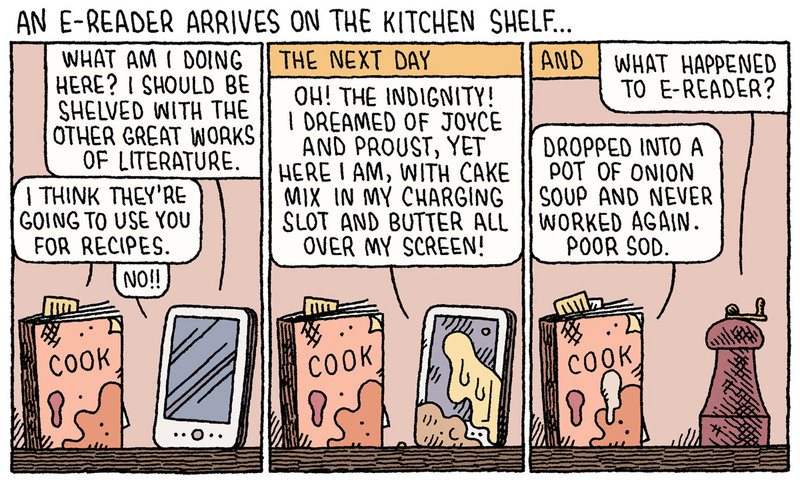 Tom Gauld: I forget why I came up with the idea, but I thought it would be funny to do a cartoon where a very serious author presented a cookery show, it was probably around the time that The Great British Bake Off was popular. I thought about Nietzsche but it didn’t feel right. Then I thought of Kafka and remembered that he wrote lots of gloomy letters (or maybe it was diaries) about death. So I drew him presenting a baking show while he said depressing things which were real quotes. I know most people won’t recognise the quotes, or even have read any Kafka, but there’s a strong enough idea of him as a bleak sort of writer that I felt it would be absurd and hopefully funny. When we had to choose a title for the collection I made a list of good phrases from the cartoons and ‘Baking with Kafka’ just sounded right. Also, I think the two Ks make Kafka sort of fun to say. 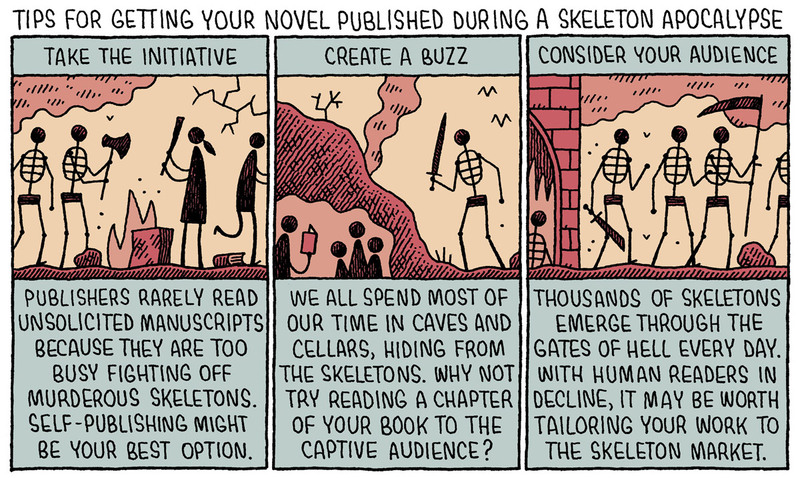 Booooooom: In “Tips for Getting Your Novel Published During a Skeleton Apocalypse” you advise one to “Consider Your Audience.” How much do you think about your audience? Do you ever worry, especially with the younger tech-obsessed generations, that some of your references won’t be grasped by them? Tom Gauld: I think any writer has to make a judgement about what assumptions to make about their audience’s knowledge. In my cartoons I try to play off what I think is the general public’s idea of a writer or work of art, rather than the specifics. In a perfect world each cartoon would be funny to somebody who has never read, say, Jane Austen, but also has something extra to tickle the person who has. Hopefully there are enough cartoonists around that somebody else can cater for people who have no interest whatsoever in literature. Booooooom: Do your friends/family ever get self-conscious that a particular observation is directed at or inspired by them? Tom Gauld: It almost never happens because the cartoons are usually based on ideas rather than observations from my life. I got self-conscious just last week when I realised, only after it was published, that I’d made a cartoon with a pompous, pretentious pigeon named ‘Dave’ and that my two friends named Dave would probably see it. I have seen one Dave since and he was ok about it, I don’t know about the other one yet. Booooooom: You’re so prolific and spoke with us in the past about your routine and forcing yourself to do a little work everyday, even when it’s hard. Do you have any more tips for keeping the creative spark alive or dealing with writer’s block? Tom Gauld: I keep a list of various ways to look at things in order to try and find something funny in them. When I’m stuck I go through the list to try and jump-start an idea. I keep most of them secret, but one is to try and think of what the opposite of something would be. For example, I wanted to make a cartoon about those courses that you can go on and learn to be a writer. So I thought the opposite would be a course which teaches you to be a bad writer, and the whole cartoon grew from thinking what that course would be like. 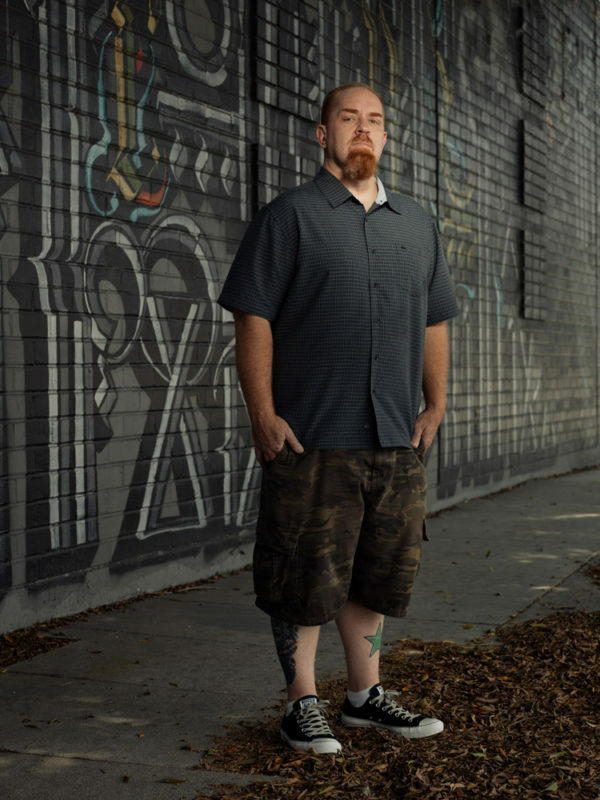 Taking a silly idea and thinking it through logically can be a way to get somewhere funny. Booooooom: What was the last book you read (and loved)? Tom Gauld: I just read a comic called The Abominable Mr. Seabrook by Joe Ollmann which is about a mostly forgotten writer called William Seabrook. I’d never heard of him but I like Joe’s other comics so I gave it a go and it was great. I like it when a book surprises me and takes me to a place I wouldn’t have expected or even chosen, but turns out to be fascinating. I also just finished John le Carre’s new book A Legacy of Spies which was just brilliant. I hope when I’m eighty-five I’ve got the energy and wit that he has. Booooooom: Can you name some of your favourite cartoonists you think we should either already know or keep an eye out for? Tom Gauld: I love the work of Anna Haifisch. She’s a German cartoonist, but her comics appear in English too. Her book The Artist is darkly funny and painfully sad and I think she just keeps getting better. The other things I’d like to recommend are all indie comic books. Not graphic novels, but regularly published, stapled pamphlets with different stories by the same artist. For mainly economic reasons, there aren’t that many around these days, but it’s a form I really love. It’s worth seeking out Adrian Tomine’s Optic Nerve, Sammy Harkham’s Crickets or Noah Van Sciver’s Blammo.